Building an email list is crucial for building a successful blogging business. Ask any professional blogger, and they will tell you about the horror stories of marketing automation going wrong. That’s why today, we’re proud to announce OptinMonster’s newest integration, ConverKit. ConvertKit is an email platform tailor-made for professional bloggers. It comes with intuitive drip email courses and powerful marketing automation features. 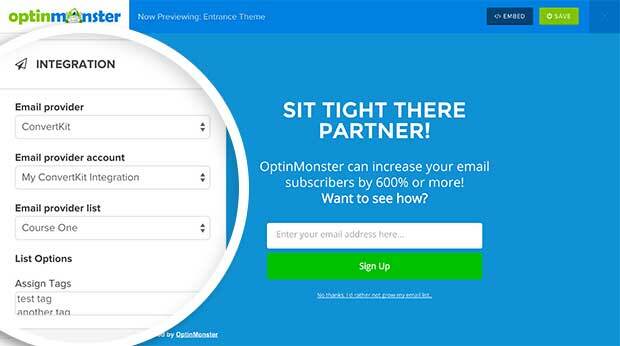 With this integration, you can combine the power of OptinMonster’s high-converting forms with ConverKit’s tailor-made email marketing platform to help you grow your blogging business. You can send subscribers to any list and assign specific tags based on their user behavior on the site with OptinMonster. The integration is very straight-forward. All you have to do is connect your ConverKit ID to OptinMonster which will display all your email lists in the builder and allow you to assign tags. See our full OptinMonster ConvertKit integration tutorial. If you’re not using OptinMonster, and you’re itching to try out OptinMonster’s new ConverKit integration, then you should try OptinMonster today and see why it is the most powerful lead generation software in the market.